… While Kubrick lets the ominous mood build slowly and steadily, taking its time and never revealing his cards too soon, the soundtrack is always busy — swarming with the drones, stabs, rattles and screeches of abstract orchestral works by Penderecki, Ligeti and Bartok, and the electronic atmospheres of Wendy Carlos and Rachel Elkind. Not content to merely use those compositions out of the box, Kubrick had his music editor Gordon Stainforth cut them into tiny pieces and carefully rearrange them for maximum effect … and the rest is horror history. To this day, I rank The Shining in my top five favorite films. I consider it a near-perfect piece of cinema, and a great deal of what I love and admire about the film has to do with its brilliant utilization of music…. [The Shining’s] discordant, modernist soundtrack (Penderecki, Ligeti, Bartôk) has few equals. The Shining chosen as the 5th best horror movie in ‘The Greatest Films of All Time’. I’ve also never seen a horror film with better music in it – I think that The Shining reinvented the horror music genre! The Shining’s score is indeed the best score in history, not one of the best, it is the best! Music to film is like colour to picture, yet, in The Shining, music is even more vital, because it is an invisible actor. It plays all of the ghosts in the movie. So deeply powerful, petrifying! Stanley’s direction blends well with his musical score which is so pulsating and creepy. In The Shining the music, photography and art direction somehow combine to create an incredible atmosphere of dread and unease…. Finally, there is Kubrick’s typically inspired use of music; weird electronic shrieks and crows by Wendy Carlos which first unsettle us, and then an indescribable battering-ram of avant-garde symphonic screeches, thuds and growls by Bela Bartok, Gyorgy Ligeti and Krzysztof Pendericki, which hammer us into submission. Watch scenes like the one where Jack chases Danny through the maze, and you’ll see photography, art direction, music and editing in simple perfect harmony. Made in the 80s, this film puts the emphasis on the psyche rather than guts. I mean you won’t see the usual element of today’s horror films, but the unique atmosphere created by the music and the beautiful setting makes this film the scariest I have ever seen. I saw this movie first with my 3 friends and on some parts we just couldn’t watch: it was just too creepy and the music does a huge part of the movie. One of the things that adds to the scare factor is the amazing music. Music has been a major part of Kubrick’s movies (2001: A Space Odyssey and A Clockwork Orange, just to name a couple) and he definitely doesn’t disappoint with this one. The score completely sets the tone and this film would not be the same without it. I just found an interview with music editor Gordon Stainforth, and I realise that he is probably the greatest unsung hero of the film, because it seems a lot of the musical decisions – well, if not decisions, ideas – were his and his alone. And I think they added 50% to the film. Never was music used to such an advantage before in a horror film. The music is great. 10/10. It delivers that sense of dread and suspense that helps set the mood for this story. Even the music is a huge part of the creepiness of the movie. It just makes your nerves stand on end and makes the characters seem that much crazier. I really love the music in here, and it does what a good horror film score should be: it gets under your skin and accentuates the scene it’s played over. Now, the best parts of this are clearly three key scenes in the film, although it does have many. The following three key scenes (Danny’s shining, the discovery of Jack’s book and the last ten minutes) are all classic scenes, among many, that really rake in the creep factor. My favorite is the novel Jack writes while there. It is the basis for one of its more memorable lines, but to see what he’s been working on the whole time is both scary and brilliant in its execution. It is the perfect caper to show that Jack has gone off the deep end and has passed the point of no return, and the way it is handled is perfect. Handling the emotions required to pull that scene off is sheer genius, and having it with that spooky music playing in the background makes it all the more terrifying. We’ve gotten clues all along, but then this comes along and puts it so clearly in our minds that it really becomes more effective than it should’ve been. The next time you watch this film, pay very close attention to the music. One thing that is unsurpassed by Kubrick is that he has an innate ability to find the most appropriate music to score his films, and this film is one of his greatest examples. Listen to how the music not only scores the movie, but is brilliantly juxtaposed to what is going on and what is being said. The music builds, it swells, and it strikes in the most surprising and frightening places. It never interrupts the action or duologue, it highlights it. The music itself is the sound of horror, and it never stops, especially when you want it to. When you watch The Shining with this in mind, you will realize that the acting and direction of the film was intentionally meant to accentuate the music as well. … It is expressionistic, not realistic. So many modern day horror film directors attempt to frighten us with ‘realism’, attempting to eliminate the suspension of disbelief…. But why attack the problem that way? If you truly want to scare your audience, don’t waste time with realism. Creep in slowly and deliberately, and make the atmosphere of the film your main concern, whatever that entails. 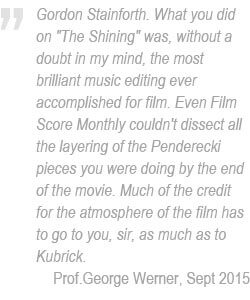 That is what Kubrick does, and he does it by showcasing the most terrifying musical score in movie history. What makes this movie stand out from others of the early ’80s is the use of modern classical music on the soundtrack. The music brings the film to an even greater level, using Hitchcock’s technique of high notes at the suspenseful moments, and chills you to the bone. The music for the movie is by far the scariest music I have ever heard from any film out there. The score, which everyone complains about, is frankly perfect for what the film portrays. The music keeps you on edge right out of the gate, which is the purpose. It’s nerve-racking. The music was perfectly set to match the mood for each scene. It’s great how the music builds up on the enigma and creates a strong tension between audience and character. When Danny is scooting round on his little tri-cycle and the music becomes more extreme, prepare yourselves because around one of these turnings something is going to happen! I have never heard more eerie, disturbing music for a film. I cannot imagine the movie without it, it’s perfect. I do remember thinking it was very clever of Kubrick (now I know it was you) to have basically composed an original score by combining the best bits from more than one recording. I think you and Kubrick may have been the first ‘music sample’ artists out there, long before rap music performers started doing it! The music editing is one of the real eye-openers, so many different works melded into an apparently unified score – I was really surprised to see how many pieces had gone into it. Such a synergy of elements as well. I think the music in The Shining is the scariest use of music in film. It has inspired nightmares in me for 21 years and counting (I didn’t see it til I was 12, in 1982) and you played a big part in that, from what I can tell. And I mean that in a good way! The best feature of the movie was the scary music and sound effects. It is one of the most creepy films I’ve ever seen. I just LOVE the music, that gives the film a even more creepy side. The music from The Shining is simply breath-robbing. The carefully selected music accompanying the film is among the best of any movie in history. It is a crime that there is no `official’ digital soundtrack available – though there are a couple of decent bootlegs out there if you look hard enough. I collect scores and wanted this 1 for many years. Of all the music for films I have and listen to, this 1 is the best ever. It is profound. The music was spine tingling, with a most frightening moment in the film actually being the cutscene, with the word TUESDAY. NON è farina del mio sacco, puccioppo. ho solo seguito una conferenzina sulle allucinazioni sonore nei film del maestro. vuoi che ti parli anche di shining? lì la musica è incredibile… butta un occhio: http://www.drummerman.net/shining/music.html leggi il pezzetto su bartok. poi prova a riprendere le sequenze in cui appare quel brano (il dialogo Danny-Jack!). ci sono *incredibili* effetti di sincronia, specialmente se si pensa che il pezzo è stato aggiunto solo all’ultimo momento in fase di montaggio da Gordon Stainforth, per sua iniziativa personale (e si sa quanto k tenesse ad avere invece il controllo totale su tutto). e la sincronia azione-musica è un tema che ritorna in tutto il film (altro es: la scena “il mattino ha l’oro in bocca”). per non parlare del patchwork eseguito coi vari pezzi di penderecki, con vari effetti *terrificanti*, tipo cori che *sembrano uscire* dalle pareti (e stanno quindi nella famosa “zona ambigua”) etc.. il tutto con musica preesistente, non creata alla bisogna (da qualche parte sulla rete si trovano gli schemi di k e stainforth, incredibilmente minuziosi e complessi). ne avrei ancora, ma fare lo sborone con roba di altri non è il massimo. The music, the AMAZING music, so scary you’ll slap yourself silly, is breathtaking and keeps you pumping with adrenaline. The film draws you in thanks to superb camerawork, atmosphere, and remarkable use of music that has you on the edge of your seat. For me, this was the real terror, and Kubrick’s approach takes the film to another level visercally. The music in this film is brilliant, it has the attendance as whole to keep you glued to the screen, because you know as things get more weird and strange, some thing traumatic is soon to happen, followed by horror. So far I have not discovered a director who used already pre-existing music better than Stanley Kubrick. Frankly no one else comes close. I like all three uses of Bartok’s “Music For Strings, Percussion and Celesta” during the scenes of Wendy and Danny in the maze, Danny outside Room 237, and Jack talking to Danny on his knee. Particularly the third one. The opening xylophone notes as Danny is quietly opening the door matches the “I hope I don’t wake him up” feeling he obviously has. Then the part of the piece where Danny asks, “You wold never hurt Mommy and me, would you?”, it gets very dark and menacing, but then the mood of the music brightens up as Jack says, “I would never do anything to hurt you. Never!” This piece of music is actually the third movement in the composition, and only about three-quarters of it. It’s amazing how the length of the edit matched exactly the length of the scene with Jack and Danny. This film has actually everything the best (music, camera, editing, lights, locations). The music is superb, adding a real, out-of-time feel. The music being ballroom, in the hotel, from the early twenties, which works well in making the atmosphere even more spooky. All of the music in the movie was used perfectly. My favorites are the old fashioned music of Henry Noble and Al Bowley used during the ballroom scenes. It takes Jack back to the 1920s and it pulls us along with him. I thought that the scene of Jack being locked up in the storeroom was priceless – when he’s telling Wendy to go check out the snowcat and the radio – great use of music and that camera angle makes it one of the best parts of the movie. I love the 1920’s tunes used in the film. Because of their ghostly, haunting quality. That music is almost like a cry from another era. Just like the ghosts of the Overlook. The use of music in ‘The Shining’ is amongst the best in any film I’ve seen, and I think its Kubrick’s most effective collected soundtrack. It’s amazing how heterogenous the total score sounds, as if the Hotel itself was sending out spectral sonic declarations. Carlos flows seemlessly into the Penderecki, Bartok, and Ligeti creating almost a symphony. Also the incidental Jazz tunes have a morose, longing quality that is perfect for Torrance’s fantasies that can never be. The way the film is made and executed is done with skill that only the great Stanley Kubrick could deliver. Everything is creepy, the straight (and I mean straight) faces of the two girls in the hallways, the rotting corpse in room 237 and let’s not forget the music which is truly weird and brilliantly chosen. This film, as far as I’m concerned is the best horror film ever made. The musical score throughout this film is absolutely great it has that chilling and tingling feeling to keep you in great drama. An expertly creepy musical score. Frightening because of the extraordinarily effective use of long shots to create feelings of isolation, convex lens shots to enhance surrealism, and meticulously scored music to bring tension levels to virtually unbearable levels. The music will have your skin crawling just like mine is with every viewing. The music was fantastic. The classical music just added to the fear. Even when Danny and his mother were in the azalea’s in the beginning it was creepy. The music IS one of the best things in the movie and you sure hear it when Wendy finds out what Jack has been writing all this time. The use of classical music was very effective, a real break from most horror movies with upbeat techno or rock music. I’d just like to say that I can remember the first time I saw the Shining. I’ll never forget how scared that made me. I actually had to press mute on the t.v. because the music scared the crap out of me. I think that the choice of music couldn’t have been any better. My favorite song is ‘Midnight, the Stars and You’. That one really does the trick. I have often marvelled at the use of the Bartok in the bedroom scene, and actually assumed that the timing of the dialogue fit the dynamics of the piece so well, that the dialogue must have been timed to fit the music! Your explanation has really upset my apple cart. The way the violin glissando goes up on a question, down on the answer, the crescendo at just the point where Danny pops the climactic question about whether Jack would ever hurt him, the entrance of the celeste right where Jack tells him he loves him – it all seemed to well timed for the music to be added later. Your post is a revelation. Thanks again, and my hat’s off to you! I must say, you and Kubrick did an absolutely brilliant job. For years, I was convinced the music was pre-selected and the action was synched, almost choreographed. I can imagine that being a highlight in your creative endeavors; having such a burst of inspiration and excitement. Cheers. That was really interesting to read Gordon. The music is very effective in the movie and the choice of music is unlike any film music for the genre. It is unique. The way the music plays into the scenes is seriously awesome, making it scarier. I think the music is spectacular almost revolutionary in the way it reflects the mood of the story and the characters. The real mastermind behind this film is the late and great Stanley Kubrick. He is the greatest director this world has ever known, and this may be his greatest masterpiece in my mind. Being the master of music that he is, he made every scene terrifying because of the music. Even when nothing is going on the movie is terrifying because of the music. The music is perfect for the movie; subsequently Penderecki and Bartok have been endlessly imitated in horror/suspense flicks. The music is awesome. I sometimes view the movie just to listen to the music. Some of the best use of pre-existing music ever assembled for a motion picture. The BEST possible selection of a pre-existing musical score. I first discovered Bela Bartok’s ‘Music for Strings, Percussion and Celeste’ in 1957 as college student…. I often similarly shared excerpts with my music appreciation classes over the next 20+ years and it always stirred a sense of terror. What a joy in 1980 to find the perfect movie to go with the music! The music weaves its own web of disconcerting vibes, and ultimately the experience, though lacking the gore typical of ‘horror’ movies, will have you on the edge of your seat. I think ‘The Shining’ just struck a chord with me and fears I had as a child, being in long empty hallways alone. Also, since I’m a huge music freak, (I’m a drummer), the music was the main thing. It’s really amazing how the film was constructed around the music. I don’t know how much of this was planned out, but it came out beautifully. You and whoever picked all of the music must have a very keen knowledge of music and what would work. Most people have no idea of the complexity of it, you have to hear the full pieces then compare them with the movie. My favorite is the scene with Jack sitting on his bed when Danny comes in to get his firetruck. All of the musical accents correlate with the scene, and they appear to be uncut! This amazes me how perfectly it was timed.